Thus read the front page of the Worcester Telegram, October 19, 1924. There was a KKK in Worcester, and a weird one. It’s worth explaining how the Worcester Klan ended up being a half-Swedish organization that directed its hatred towards Irish and Italians, not blacks. The first version of the KKK or “First Klan,” was a racist terrorist group formed in the wake of the Civil War. It died out in the 1880s. Then, in 1915, the smash pro-Klan film “Birth of a Nation” inspired a rebirth of the movement, the “Second Klan.” It really took off in 1920 when it adopted aspects of multilevel marketing, with some Klan recruiters getting rich and Klansmen buying lots of crap from the national organization like helmets and even robes—DIY Klan gear was frowned upon. The Central Massachusetts Klan seems to have started off in outlying areas, then spread to Worcester where Clarence J. Kearney and Bertram B. Priest were the organizers. 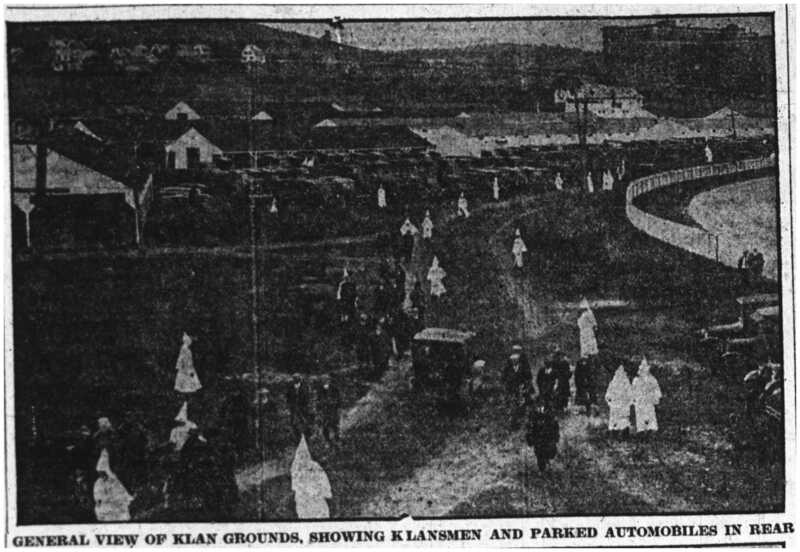 Klansmen tried keeping their identities and meetings secret (always denying involvement if asked by the press), but protests at their events were common. The area around Leominster had it especially bad. At one clash between Klansmen and anti-Klan groups (called “antis” in the press) Klansmen opened fire with a couple shotguns, leading to 6 people (including a cop) being shot non-fatally and 6 arrests (from both sides). Two Catholic schools were burned down. Closer to Worcester, cross-burnings were held in many towns, including in front of a Catholic church in Charlton and in front of the Notre Dame convent on Plantation Street in Worcester. One Klan event at Mechanics Hall drew thousands of people on both sides. (Maine KKK head Eugene Farnsworth was the speaker, and later bragged he “never expected to get out of the city alive.”) Up to 300 antis gathered outside regular Klan meetings at Upton Methodist Church, drawing the notice of state police. 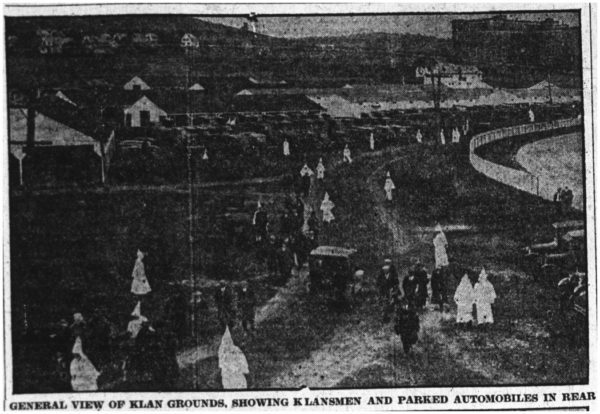 And so in October 1924 the KKK planned the largest Klan event New England had seen or would ever see. They rented the fairgrounds in Greendale and held a one-day event that drew 9,000-15,000 attendees. 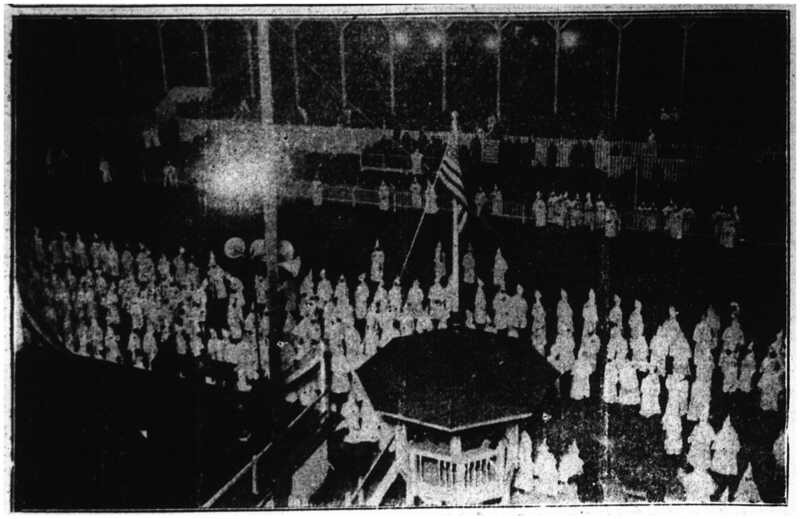 A thousand people wore full KKK costumes, and 2,600 people were inducted into the KKK. An airplane flew circles over the crowd, decorated with KKK symbols and a glowing red cross of lightbulbs on the bottom of the fuselage. (One press report described it as “like a red ruby in the sky.”) There was a fireworks show. A national Klan leader spoke against immigrants from Southern and Eastern Europe and hustled the crowd to buy some $10 KKK memberships. Crowds gathered outside the fences but stayed away from the gates, where the Klan had posted guards. As midnight approached the event ended, and people began to drive home. A couple hundred yards from the main gate some kind of conflict flared up, and an anti-Klan mob began throwing rocks through their car windows. Auburn teen Michael Burke was arrested for rock-throwing (and later fined $25), and the crowd calmed down, only to get rowdy again once most of the Klansmen were gone, flipping one car and setting the fireworks technicians’ car ablaze. All this continued for several hours. When the KKK figured out that their route home contained a riot, they started leaving via Lincoln Square or Chadwick Square, and part of the mob dashed to these places to harass them. In Lincoln Square, Klansmen Roy Salten and Richard Whitten brandished revolvers and were arrested. (The charges were later dropped in court. Also, Whitten identified as a “Nova Scotian.”) A couple others were charged with things like disturbing the peace or, in one case, driving at night with no headlights (after the mob had ripped out his headlight cables). Klan riots were common nationwide. Two days after the Worcester riot, Detroit police used tear gas to disperse a crowd of 10,000 Klan sympathizers trying to keep people from attending a talk by the president of the National Anti-Klan Association (who was, weirdly enough, very into white supremacy). At some point in 1925, the Worcester Klan collapsed. This reflects the nationwide fate of the Second Klan, which like so many pyramid schemes boomed before falling apart overnight. The Klan went from half a million members in 1921 to 4 million in 1925 to less than half a million in 1926 to basically nobody in 1928. Opposition to racist or fascist organizing in Worcester was mostly not riot-based in the following decades. The closest thing to an exception in recent years was when the wannabe-nazi group NEWP attempted to hold an organizing meeting at the Worcester Public library in 2011, at which a dozen masked opponents showed up, the emcee was brained with a bike lock, and the meeting was then adjourned. Many thanks to the passionate librarians of the Worcester Historical Museum and the Worcester Public Library for their help in researching this article. Al Southwick’s writing on Worcester history was, as always, a big inspiration. Paul Robinson of Spencer occasionally got work flying a KKK plane at Klan rallies or as an uninvited part of non-Klan airshows. It had “KKK” painted on one side and Klan symbols on the other. Lightbulbs formed a glowing red cross underneath the fuselage. Journalists in Worcester writing about the rally that day said that the plane was one of the highlights. After flying around awhile, it landed suddenly in a nearby field. A rumor started it had been shot down. Journalists observed a “bullet hole” but were told it had been there awhile. (As well you might expect a plane with a lightshow underneath might have the stray drill hole.) Robinson fixed what he said was a clog in the fuel line and was back up flying. If the plane was shot down: Why was Robinson eager to continue flying? (The Second Klan was a secrecy-obsessed pyramid scheme, not a hotbed of martyrs.) If the plane was shot down: Why wasn’t the plane, lit up like a Christmas tree, shot down again? If the plane was shot down: Why didn’t anything else that crazy happen that day? If the plane was shot down: Why didn’t the Klan, like modern American fascists always eager the play the victim, make a huge deal about it?